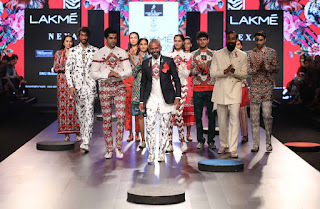 The excitement of Lakmé Fashion Week Winter/Festive 2017 saw a continued stir on Day Four at Johnnie Walker – The Journey show. The runway was ruled by very talented Gen Next designers, Asa Kazingmei, Abhishek Paatni and Ajay Kumar. The three very talented designers also presented a specially curated limited edition capsule collection inspired by Johnnie Walker’s iconic striding man. Show Stopper Ali Fazal brought the striding man to life in Asa’s stunning rendition of progressive fashion. On the collaboration, Vijay GR, Sr. GM, Marketing at Diageo India said “Fashion has always been a strong reflection of change and progress within a culture and through a creative partnering with the Next Gen designers we are very happy have to bring forth a Johnnie Walker – The Journey capsule collection that celebrates the forward moving persona of the striding man”. At the Johnnie Walker – The Journey show Asa Kazingmei made fashion lovers in the audience applaud his amazing creativity. The designer has catered to men’s and women’s wear buyers with the Bollywood starry clientele lining up for his edgy structured clothes with extreme detailing in leather and denim. Asa has always presented fearless fashion and this season at Lakmé Fashion Week Winter/Festive 2017 he brought ‘Invincible’ haute couture with his customary strong, styling, elements for men’s and women’s wear which were the highlight of the collection. For Asa fashion has to be beyond Simplicity so the mix of ancient warriors’ influences and contemporary punk culture made a dramatic, emphatic, style statement on the ramp. Bringing a hint of fashionable aggression to his collection, the Winter/Festive 2017 look had courageous style elements with power dressing being at the crux of the look. Asa worked only with a fabric base that comprised leather and denim but detailing was once again with the intelligent use of metal work that featured chains, spikes and fringes. The sharply cut garments in myriad silhouettes offered structural cuts, detailing and were further enhanced with clever embroidery. The laser cut black hoodie was a battle-ready offering with multiple-strap-detailing, while the fringed harness over black Tee and matching denim trousers accessorised with cropped knit gloves made a strong statement. For a more arresting entry there was the sheer Vest with leather straps teamed with a fraggled shoulder cover. The accompanying trousers matched the aggressive nature of the embellishments. The fierce glamazons who strode down the ramp very confidently wore leather waist coats, corsets, beaded fringed miniskirts, and moulded corset dresses with extended conical shoulder detailing. The warrior like shoulder armour in leather and multiple belts that emerged from various angles ensured that the look was inspired by the furious action but made stylish fashion statements. Giving a modern twist to the breastplate, Asa offered it in leather with the most intricate and detailed designs to present a male/female wardrobe options that announced fearless but strong fashion elements. 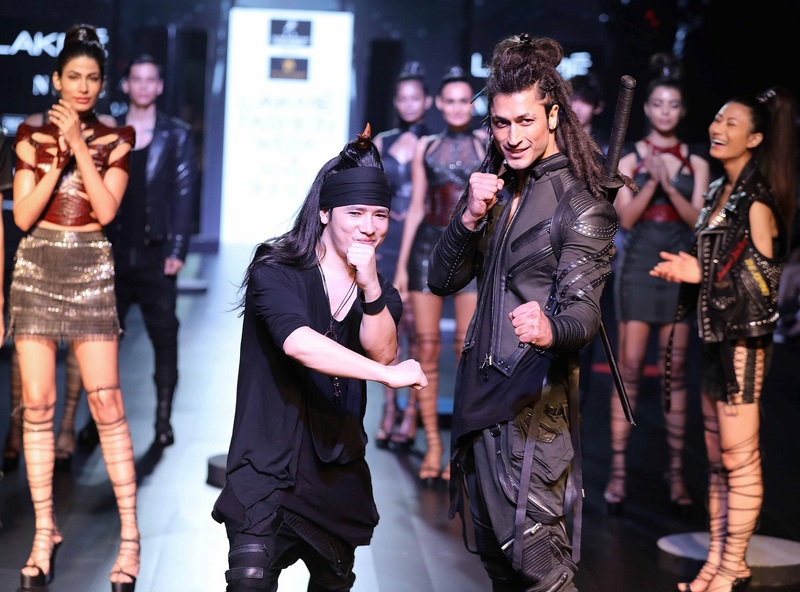 Ending the show was the ‘true blue warrior’ Vidyut Jamwal, whose leather /denim jacket, multi pocket pant with zippered detailing and vest proved that he was all ready to fight it out. And that is just what the aggressive Vidyut, star of the great hits like ‘Commando’ and ‘Force’ did as he demonstrated his expertise with two swords in a perfect warrior like demeanour. When it comes to attention grabbing clothes then ‘Invincible’ haute couture by Asa Kazingmei will be the collection that individualistic personalities will rush to when they want to be the fashion warriors that battle mundane trends. Making a very impressive fashion debut with his NoughtOne label at the Gen Next Lakmé Fashion Week Winter/Festive 2016 show, Abhishek Paatni has now moved up the fashion ladder with his many fashion showings in the country and has become the haute favourite of stylish men and women. Abhishek men’s and women’s wear collection has always made a strong fashion statement. At Lakmé Fashion Week Winter/Festive 2017 his label ‘Zero.Zero’ presented ‘Street Alpha’ a line of fast paced garments aimed at the contemporary New Age male who loves to move at jet speed through life. ‘Zero.Zero’ is the derivative of Abhishek’s ‘NoughtOne’, which has affordable prices and aimed at the young trendy buyers. 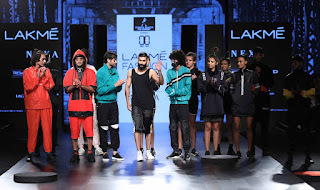 Speaking on this occasion Abhishek said, “It was a great opportunity to be a part of Lakmé Fashion Week and this season my collection is called ‘Street Alpha’ - it Alpha is engineered for people who seek comfort, utility and fun while going through their daily routine. As a part of my collection you will also witness a series of looks inspired by the iconic Johnnie Walker. Through this collaboration, I aim to bring alive the striding man through our street aesthetic and modern approach toward tailoring combing the conventional with contemporary in total harmony. It's my utmost pleasure to design this collection for Johnnie walker the journey and I am really looking forward to the show”. Making the Street-smart wearer his prime buyer who opts for street culture despite societal restrictions, the outfits were geared for comfort, utility and large doses of fun. Working with an assortment of fabrics like suede, polyester mesh, French terry, jersey, cotton and parachute, Abhishek ensured that the colour card was vibrant and full of excitement. Striking long line Tees, cool hoodies, some relaxed sweat shirts and bombers gave a laid back vibe to the men’s and women’s wear offering. The label had fun colours, prints and silhouettes that will hit the racks every quarter. Detailing like quilted patch pockets and zippers appeared in a combo of parachute and leather. Zippered jackets were worn with denim cargos with ribbed ankle accents. Women’s wear followed the masculine style directions as zippered long-sleeved shifts were accentuated with parachute yoke, sweat shirts had zipper pockets and the drawstring hem line was eye-catching. When it comes to stylish but statement-making fashion wear, the ‘Zero.Zero’ label by Abhishek Paatni definitely had the right options with the ‘Street Alpha’ collection. As a part of the collection the audience witnessed a series of looks inspired by the iconic Johnnie Walker. Through this collaboration, Abhishek Paatni aims to bring alive the striding man through his street aesthetic and modern approach toward tailoring combining the conventional with contemporary in total harmony. When it comes to the colourful fantasy of digital prints, Ajay Kumar is the master of the genre. For several seasons, ever since he made his debut at the Gen Next Lakmé Fashion Week Winter/Festive 2015 show with his men’s wear, he has been regaling fashion lovers with his extreme print techniques and design philosophy. At the Lakmé Fashion Week Summer/Resort 2016 Ajay launched his women’s wear line. “This time at Lakmé fashion Week, we have been truly inspired to go beyond and create. My collection is not inspired, but is a reflection of my thoughts-becoming conscious towards environment and society. It captures the story of fashion as a motivator of change from within oneself. This season’s collection has seen the use of natural fabrics, khadi and handloom fabrics developed through collaboration with various clusters across India. This year the showcase is very special as one will witness a series of looks inspired by Johnnie Walker’s Striding man ,and just the way the Striding Man narrates stories of personal progress my collection does the same.” said Ajay Kumar. The strong, bold, flamboyant, intricate, vibrant, graphic, digital prints are the trademark of the label. Using hand woven and natural fabrics, Ajay has created show-stopping apparel that has appealed to the trendsetters in the country and abroad. 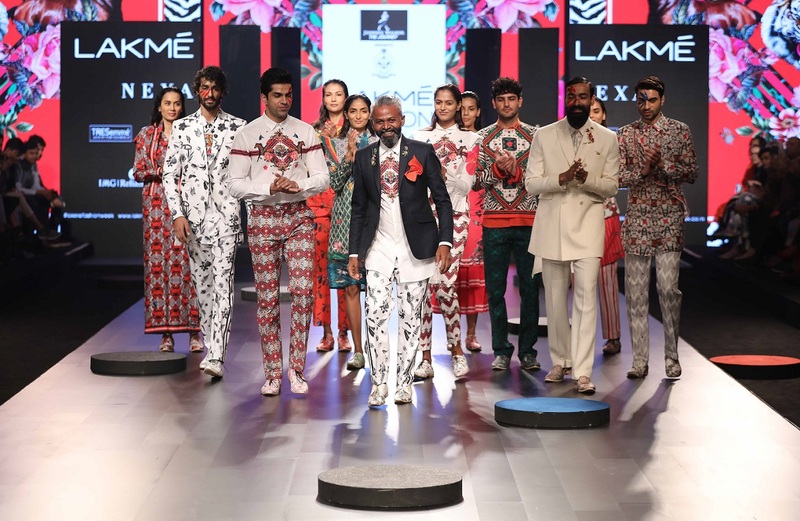 For Lakmé Fashion Week Winter/Festive 2017 Ajay’s ‘Bhu-Svah’ collection was inspired by the beauty, culture, flora, and fauna of India along with a deep fashion rising from within. As fashion’s seasonal changes transform dressing, the ‘Bhu-Svah’ collection brought to the forefront the sustainability of style with the use of natural fabrics. Ajay’s textile base was a great story that empowered individual and communities in the value chain. The handloom fabrics and Khadi were developed with clusters throughout the country. Splashing them with his signature digital prints that featured the Indian scenic beauty, the collection offered to men and women a fusion of sartorial codes and athluxe. For men’s wear there was the amazing giant, lapel, cropped, ivory, woollen, jacket teamed with a long-line white shirt sporting a peacock feather print at the collar. The kaleidoscopic multi-coloured printed long-sleeved tunic was a striking entry for men. Complete suits were in iconic prints that Ajay is known for. Button less cropped blouson was teamed with tunic and trouser, while shirts were highlighted by placement prints. Women’s wear was fun and ever so colourful again with the printed long-sleeved smock bringing in rainbow colours onto the ramp. The sheer, fuchsia, embroidered, striped, belted, long-sleeved, dress was a fun garment that will work perfectly for a brunch. Peacock print trench coat with a white kurta, blouses, blazers, blousons, the final maxi and jacket in vibrant prints ended the show on a high note. For fashion statement makers who want to project their inner sartorial moods, Ajay Kumar’s ‘Bhu-Svah’ collection will take them on the high road of style and elegance. All three designers showcased a beauty look, which represented perfect skin using the new dewy foundation. Lakmé Makeup Expert, Donald Simrock also added colour blocking specifically for the Ajay Kumar set.